Home Recipe Bread and Butter Pickles – Organic AND Perfected! 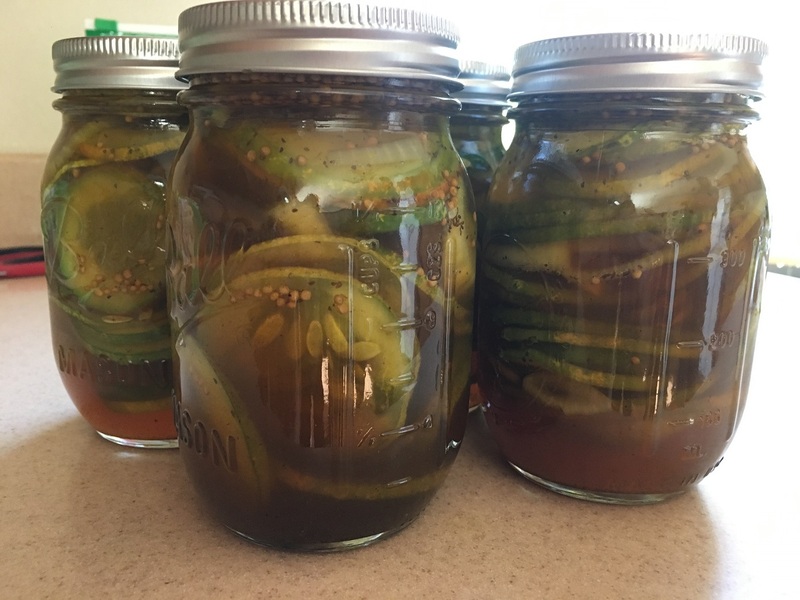 As promised from last week’s dill pickle blog, I was going to share another pickle recipe. Bread and butter pickles. This recipe is great for making some sweet, tangy, crisp, and delicious bread and butter pickles! Last year, when we made some bread and butter pickles, I was super excited about it. But when tasting them it quickly turned to disappointment. They had way too much onion flavor and were kind of mushy. We eat a lot of pickles in this family and bread and butter pickles are a favorite for the majority of us, so this was a huge disappointment. We didn’t even eat more than that first jar – or did we even finish it? No, we probably did, we do hate to waste food in this homestead. This year I was determined to find a good recipe. I decided I would make several small batches of pickles using different recipes. But, just like my dill pickle recipe, after trying the first batch I was super excited. They tasted so good, I didn’t even need to try any other recipes. I KNOW we finished this jar. We went through it in only one sitting! Well, perhaps I shouldn’t say I found the perfect recipe first off. I couldn’t even find a recipe that sounded ideal to me. In my quest for perfection, I decided to slightly modify a recipe I found that looked close to what I wanted. I used a lot less onion than the original recipe called for and didn’t cook the cucumbers in the vinegar mixture. I just packed the cucumbers in the jar and then poured the vinegar mixture over them. This was easy and worked out marvelous. I also soaked the cucumbers in pickling lime and water for that extra crispness I mentioned in my last post, too, instead of the salt and ice. Now for the perfect perfection of my bread and butter pickles! Organic! I decided to try making these pickles completely organic. Unfortunately, I wasn’t able to find organic mustard seed at any store and organic white vinegar is also hard to find and expensive. So, I decided to try using mustard powder and organic apple cider vinegar. The organic pickles turned out fantastic! Some might think they have a slightly different taste from normal ones due to the change of using the apple cider vinegar, but they are still delicious! Here is the recipe I used to make the pickles. Please read the notes at the end of the recipe. I’m adding information for an organic option. I hope you try these pickles and enjoy them as much as I do! Bread and Butter Pickles - Organic AND Perfected! In a large container, combine the cucumbers and onions, and cover with soak water. You can use 1/2 salt or lime in your soak water. If using lime, mix 1/2 cup per gallon of soak water. Let stand for 12-24 hours. Drain; rinse and drain again. Rinse 3 times if using lime. In a large pot, combine the sugar, vinegar and seasonings; bring to a boil. Remove from the heat. Pack cucumbers and onions into hot pint jars. Pour or ladle hot mixture into jars, leaving 1/2-in. headspace. Remove air bubbles, wipe rims and place lids on jars and screw on tightly. Process for 15 minutes in a boiling-water canner. You can now have homemade organic pickles! To make organic pickles you just use all organic spices, cucumbers, and onions. Organic mustard powder can be used in place of the mustard seed. Just use the same amount of powder as you would seed. Organic apple cider vinegar or organic white vinegar can be used in place of the vinegar. Organic cane sugar can be used for sugar. These look great! I love homemade bread and butter pickles, and these fit the bill for a recipe that I definitely would love to try making at home! Thank you so much for sharing! Thank you for your comment! Let us know how it works, bad or good, we are always looking to perfect!